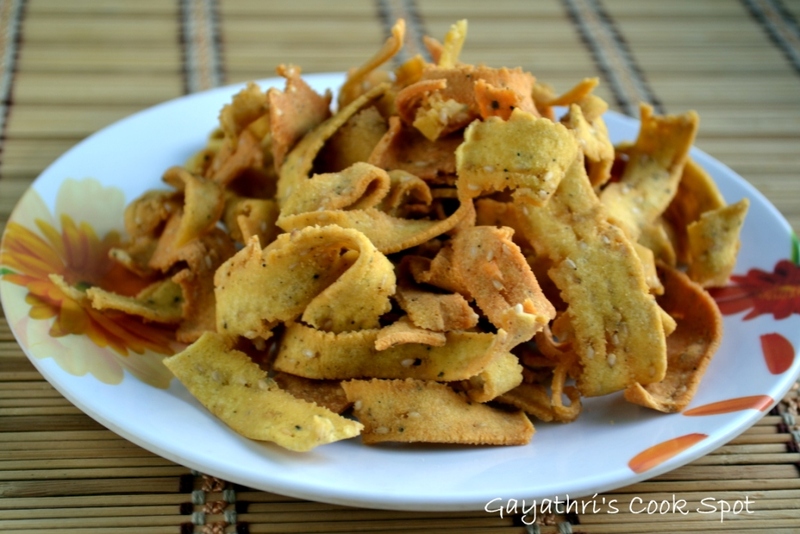 Cheeval or ribbon pakoda can be prepared with chevu dough. There are so many recipes for this snack. I made it with rice flour and besan along with sesame seeds and pepper powder. You can also add garlic paste for a nice flavor. Mom gave this recipe and I made some changes like adding butter and pepper powder. He press used for cheeval has a small rectangular opening so that the dough comes out like ribbon. That is why it is also called as ribbon pakoda. The press I have is wooden and the plate is bronze. It was bought by my aunt from Karaikudi and it is a very nice press. Today is the final day of Blogging Marathon#22. I am linking this to WTML hosted by Preethi and started by me. 1 1. In a bowl mix all the flours along with salt, sesame seeds and butter. 2. Add enough warm water and make a soft dough. 4. Take a portion of dough and fill the cheeval press. 5. Press out in spiral formation directly into the hot oil. 6. Remove when the sizzling stops. 7. Repeat with the remaining dough. 8. When cool, crush the spirals into small pieces. 9. Sore in air tight jar. This is he cheeval press. Take a portion of the dough. Fill the press with the dough. Press out spiral murukku into hot oil. Remove from oil when sizzling stops. Crush them when cool into small pieces. Store in airtight jar. Love this crispy and crunchy snack!!! delicious! Love that pepper touch here, looks prefect and super crispy.. This looks so good and I have not tried it with pepper flavour.